2017 Ford F-350 SuperDuty Lariat For Sale In Vernon, Kelowna, Okanagan, BC. Be prepared for hard work with the truck that gets things done. With your choice of either the 6-3/4' or 8’ box and Crew Cab or SuperCab, the 2017 Ford F-350 SuperDuty Lariat ready to meet your needs. This four-door pickup is built to take on any challenge and provides seating for up to six to take the crew along. 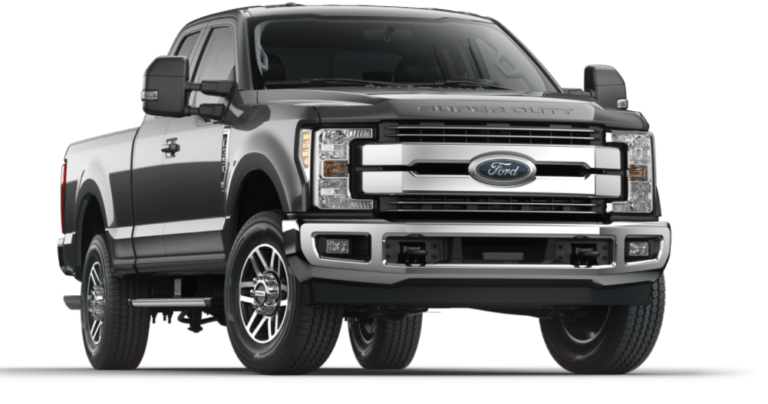 Bold design for the 2017 Ford F-350 SuperDuty Lariat starts with the chrome two-bar style grille which proudly displays the Ford emblem and sits between the quad-dual beam headlamps. Power heated PowerScope trailer tow mirrors come standard and showcase the practical side of this truck. In addition, LED box lighting makes working after dark a little easier. Loading and unloading is simplified with the Tailgate Assist and locking tailgate while running boards and available tailgate step provide convenient access. Tow hooks in the front are standard while you can add two more in the back. As hard as you work all day, you deserve the comfort the 2017 Ford F-350 SuperDuty Lariat provides. Heated and cooled front seats are standard with memory settings for the 10-way power seats. While premium vinyl upholstery comes standard for easy care, you can upgrade to the premium leather for added refinement. In the Crew Cab, the rear bench seat folds flat with lockable storage. Make your workday more enjoyable with the clear sounds that come through the Sony audio system with 10 speakers on the 2017 Ford F-350 SuperDuty Lariat. Choose your favourite station with SiriusXM satellite radio while SYNC 3 makes it easy to set your stations and manage your infotainment system. No matter where your job takes you, the available navigation system will get you there. Make the 2017 Ford F-350 SuperDuty Lariat work for you with the right Ford accessories. Add a tool box to keep your equipment safe and close by. Bed rails and other cargo accessories help you stay organized while covers and liners protect your pickup from damage. Thanks to the remote start, your truck is always ready to go when you are. Be ready to tackle the heavy jobs with your choice of gas of diesel engine with the 2017 Ford F-350 SuperDuty Lariat. This truck can handle towing a large load thanks to the TorqShift six-speed SelectShift automatic transmission, which ensures a smooth ride. With the option of either 4x2 or 4x4 configuration, you can take on any terrain or road conditions with ease. Thanks to advanced safety features, you can travel with confidence with the 2017 Ford F-350 SuperDuty Lariat. Every 2017 Ford F-350 SuperDuty Lariat is backed by Ford’s superior warranty. With a solid reputation provided by previous generations of Ford trucks, the 2017 Ford F-350 SuperDuty Lariat continues to impress buyers and critics alike. This pickup offers impressive capability and dependability while providing a generous amount of style and comfort. Designed to meet your need for work and play, Ford pickups ensure no compromise is necessary. Stop by Watkin Motors Ford to see our large selection of Ford trucks. No matter the job or the size of truck you need, we offer a vast inventory to ensure you drive home in the right model. Trust your local Vernon Ford Dealer – Watkin Motors Ford to put you behind the wheel of a new Ford truck today.